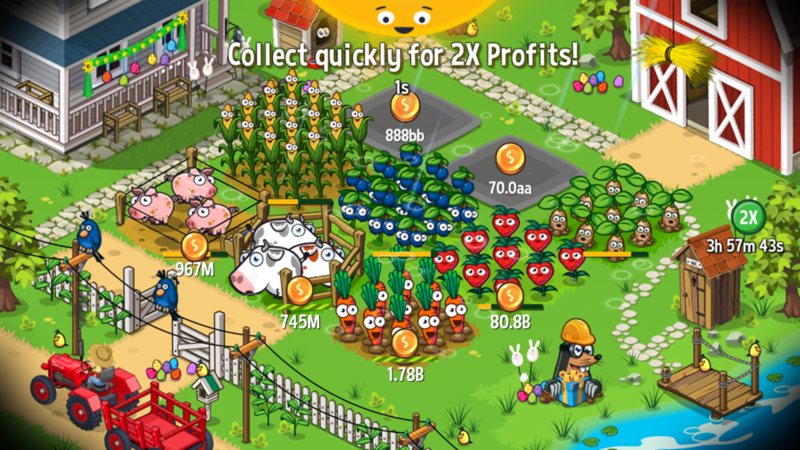 An Idle game’s core loop revolves around producing as many coins as quickly as possible. In order to do this, a player must purchase exponentially costly upgrades that increase their coin production rate. It’s a positive feedback loop. The objective for a player becomes maximising the efficiency of earning currency. The skill in these games is choosing which upgrades are the most efficient. Rather than digging too deep, remember that for players, increasing the rate of earning feels powerful — and upgrades that provide 2X or 4X increases to your coin production for short periods of time feel very rewarding as progress is noticeably sped up during your session. 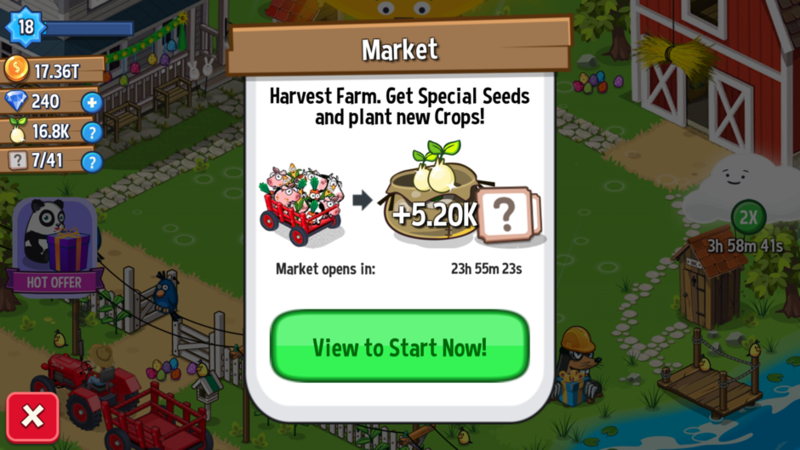 “Farm Away!” wraps the idle mechanic to planting and harvesting crops so that you can upgrade your crops and increase your rate of earning by buying more plots. 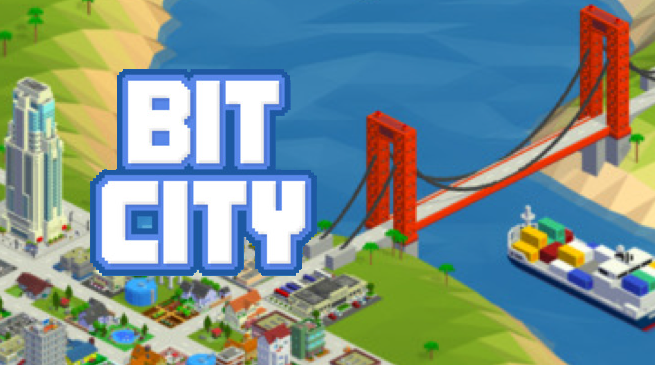 “Build Away!” uses a very similar system but you buy various building types and place them in blocks within a city. Both games allow you to sacrifice all of your crops or blocks in order to get seeds in “Farm Away!” or keys in “Build Away!”. Investing into seeds or keys provide global growth bonus’ to help your future farms or cities. Nobody wants to watch a video ad. So if you’re going drive a full video ad view you need to make sure it doesn’t feel forced (it’s opt-in) and players feel they are getting a benefit from it. If you think of watching a video ad as a transaction of time (30 seconds) it will help you to design systems that respect the player’s choice. Just as buying an in-app purchase is asking people to sacrifice money to gain progress, here you are asking players to sacrifice their time to watch an advert. Asking players to do this not always possible or preferable, you might be sat on a busy train or having a romantic catch up with your girlfriend. Playing mobile games while having a romantic catch-up with your girlfriend is not advisable or you may find your romantic catch-ups become few and far between! Therefore, allowing users to opt-in to view your video enables them to choose a time and place to sacrifice their time. People will very quickly learn which features of your game are powered by video ads. The clarity of the trade enables people to opt-in when they will get the most value for themselves. Clearly labelling the reward at the point where you choose to watch helps here. Enabling scheduling and power-ups that each work for different amounts of time enables a player to chose the most efficient trade for them at that moment in time. Having a breadth of options that caters for these needs leads to many more opportunities to view a video. More opportunities give a higher chance that any one of these might convert to a video view. Making a video ad watch opt-in allows for scheduling, but making the reward feel positive and special will lead to higher conversions. Well designed rewards are those than enhance a player’s experience. For example, a boost to currencies the player would normally receive, increased speed to reward or a dramatic / exciting feature that isn’t normally available. As with in-app purchases, a strong sense of value makes watching the video feel worth it. Rewards from video ads don’t only need to come from giving away currency or increasing the rate of currency gained. People appreciate novel experiences, limited offers or a chance at a grand prize. 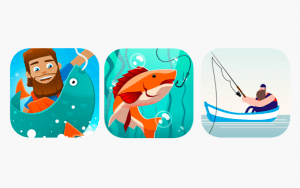 FuturePlay uses 4 different strategies that each create a positive experience for their users. Remember as we discussed in the mobile video ads value chain increasing the number of views per DAU will lead to greater payouts in the end. So from a game design perspective building systems that can support 2-8 views in a single session rather than the classic 1 or 2 can have huge increases in monetisation. The daily double effectively monetizes because it is high value (2x) and that starting value grows with time (seconds away from the game). Therefore, however long it has been, this bonus doubles it! 2X feels very rewarding for clickers and as a retention mechanic you get a larger boost no matter when you last logged, making your start feeling great! Presenting a forced pop-up on appStart before the game begins, increases the % of your DAU which is likely to opt-in. People can only convert (earn you money) to an offer if they see it. People won’t feel bad if the opportunity is opt-in and valuable. As with all free to play designs you know your players are fickle, most players won’t even come back after a single day. Therefore forcing a high value, time-limited opportunity to kick start their game when they come back has the highest chance of conversion. For the view-to-play model to be successful you need to bump your average views per dau to 2-4. The way to do this is to be quite forceful. appStart provides the highest number of opportunities because it’s the first thing people will see. The daily double is only presented once per session. By creating a scarcity in availability, people perceive the offer at a higher value even if the actual reward might be smaller. Putting people on the spot leads to more conversions. There are a number of psychology articles that talk about the effects of scarcity and it’s been used in marketing since the early 1970’s. Any offer which is time or availability limited can create higher conversions due to a sense of urgency for players. 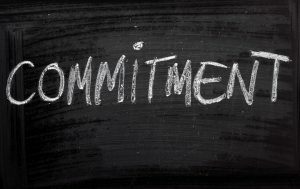 To be effective the offer system should be presented to users multiple times across multiple sessions teaching people of its scarce nature. The more someone recognises a scarce item, the more likely they will be to convert when they see it. A good cadence for offers like this depends on the value of the reward. Once per session (Daily Double) has high cadence, low monetary value. 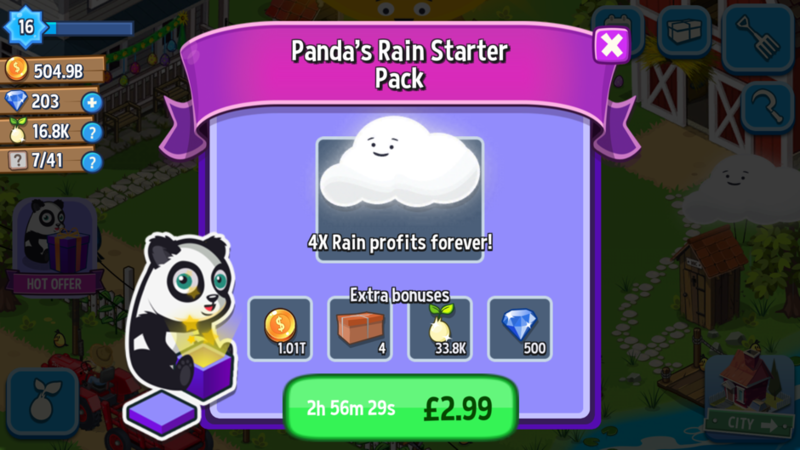 A starter pack or time limited purchase (new players only) has high value, time limited. A special offer tied to an event or big update has high value and is availability limited can help to convert non-spenders into spenders. Video ad’s work best at the higher cadence lower value trades, whereas IAP works better at high value limited offers such as starter packs. 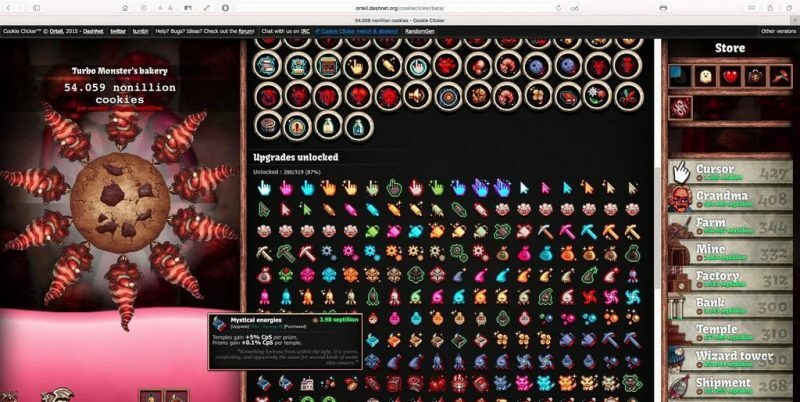 Clicker games benefit by being able to vary the rate of earning easily as their core loop supports a huge amount of depth. By creating a large (2X or 4X) growth for an extended point of time the sessions themselves feel faster and progress feels quicker. This is quite like a feeling of increasing the flow of time (simulation) or even slowing down game-time in an arcade runner where a player’s game is made more comfortable. This form of trade adds value to your session, rather than short and sharp currency bonus’ that are quickly used up. In other genres, it can be hard to create a similarly powerful video view because you need to keep a tighter grip over currency inflation. You should therefore consider speeding up an aspect of your core loop that encourages more play or more comfortable play of the core loop. For instance in a Base, Battle and Build (BBB) game, such as Clash of Clans, you might opt to increase the training speed of units by 2x by watching a video ad. This encourages more gameplay but doesn’t break your economy, it increases the number of battles played which positively reinforces the core loop. If you have an RPG or adventure game then you might improve drop rates for 4h after watching a video ad encouraging people to continue to play longer sessions in order to maximise the benefit of the ad. Using video ads to strengthen the number of times a core loop is performed helps reinforce the positive moments and maximise the efficiency of a player’s time, creating a win-win scenario. People run into situations where they need a little bit of help to achieve a gameplay goal. Creating a novel and fun power up that provides a short but sharp economic boost to help them reach a goal in that session. 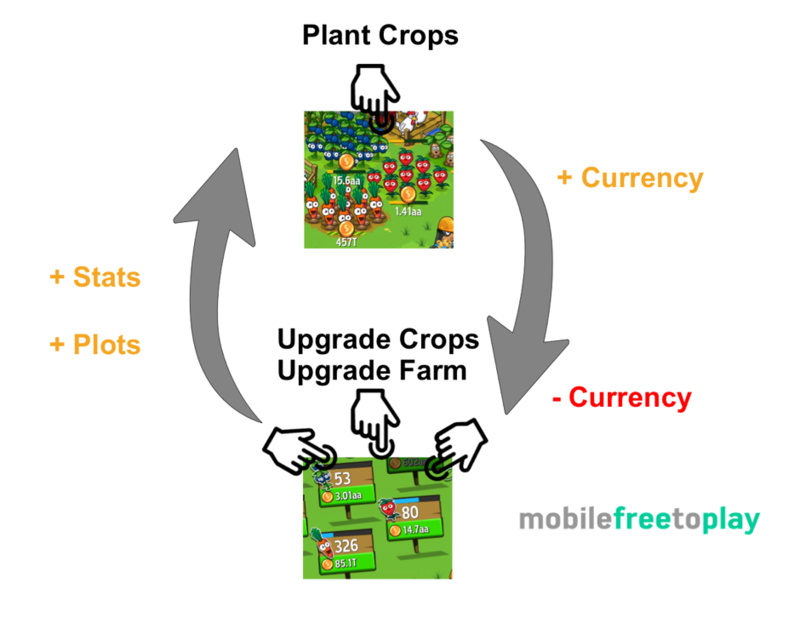 Futureplay turns this relatively simple power-up into a moment of joy for the player by encouraging them to interact intensely with the core action of harvesting in FarmAway! or collecting income from buildings in BuildAway! 20 seconds feels natural and a user can further increase the value by swiping as quick as possible to get an even bigger bonus. Power-ups like this work by creating large environment changes such as increased animations, novel buildings or rare characters. The aim should always be to leave the user with a positive feeling. Some users may even watch a video ad in order to play the 20s mini-game. Think of a feature that fits your theme and allows people to play intensely for a short period of time, this might be doubling attack speed of a unit or increasing the power/size of in-game power ups in a match3. Think about ways you can trigger an exciting and special moment in your game that is unique but powerful to users. Certain features within your game might be critical to a player’s progress or score. 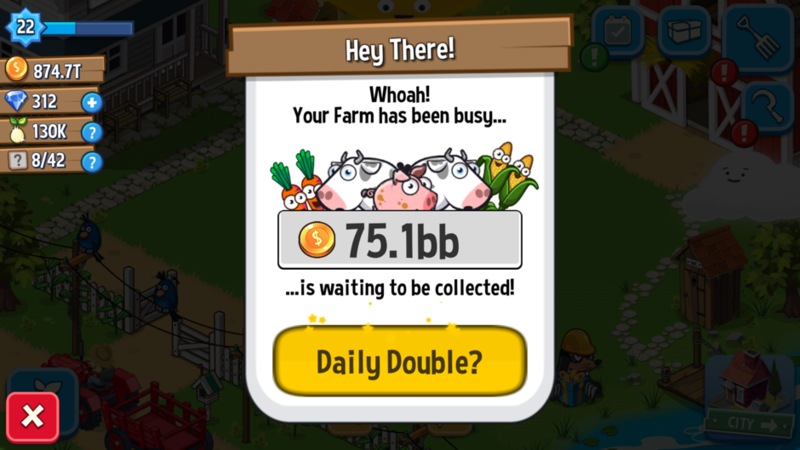 In clicker games sacrificing your progress for global power ups is core to reusing the loop. Futureplay created a great and simple 24h blocker to prevent instant sacrifice. Players can skip this wait by watching yet another video ad. Patience is a virtue, but enabling players to gratify themselves instantly increases your views per DAU. 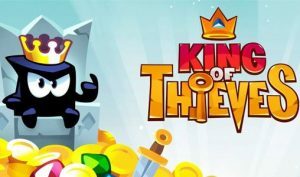 Endless runners and frustration games use this very effectively to help people continue their progress in an attempt to get the highest score for a single run. Unique abilities or instant gratification work so long as they are opt-in and don’t break your core game loop. Every game is different but by creating options and presenting them at different points allows people to choose when to feel clever. The 4 different methods of watching a video are all unique but tied to positive actions that help a player to progress in their game. By providing 4 different features to watch a video, Futureplay has maximised the opportunities for players to watch a single video. In order to really boost their views per DAU, they have made more positive and valuable reasons to watch more than once. Every video views bonus stacks. So if the Session Doubler and Instant Gratitude feature are used together and effect 2×4 = 8x growth for a short period of time. Extending the period of certain bonus’ can occur by watching more than one video, this helps players to schedule their time in the game. Effectively providing players with more opportunities to engage with video content around a feature will increase your views per DAU. Stacking of video views works well as long as you have a robust economy, be very careful that too many trades for currency or in-game growth don’t break late game systems in the game. When in doubt block players from too much stacking or extends. 2 or 3 stacks is enough for any single session. In this way, you can be sure that players need to keep coming back day after day and engaging with your game over a longer period of time. At Slush in 2015 Futureplay revealed the Launch DAU and ARPU for FarmAway! 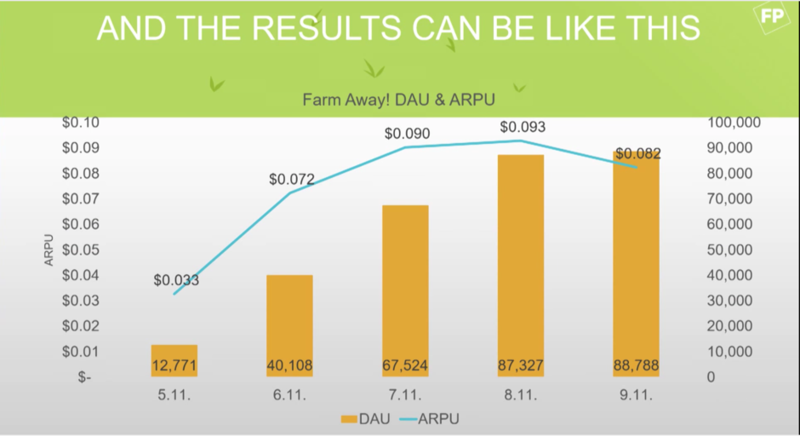 Launch numbers and a staggering $0.09 ARPU during the launch window. Although they might not have maintained their high ARPU, it still shows what is possible for games that use the view-to-play model. View-to-play monetisation is now large enough to support gameplay mechanics that don’t work well with an IAP model. The biggest mistake companies make when trying to integrate the model is not providing enough opportunities for players to watch. Each of these opportunities should provide a positive experience either through value or interaction with the mechanics. High-value trades lead to a greater conversion of videos, but be careful that your economy is robust enough to handle this. When looking at your analytics make sure to track the video views per DAU in order to create features that lead to higher views. As the name itself makes clear View-to-Play requires views to generate revenue, use this to guide your development. View-to-Play is not applicable for all genres, but for some, it will be more lucrative than in-app purchases. Be sure to stick to the four guiding principles of view to play and track your video views in your analytics accurately. View-to-Play is here to stay and gives you more options to create financially successful games outside of the standard Match3, BBB or RPG mechanics.